I don't find it the least bit ironic that I found out about Pho 54's daily deals from one of the wealthiest people I know. The guy is loaded alright, but he didn't become that way by eating at Charlie Palmer's every day. Frugality, as many self-help financial gurus will tell you, goes a long way. 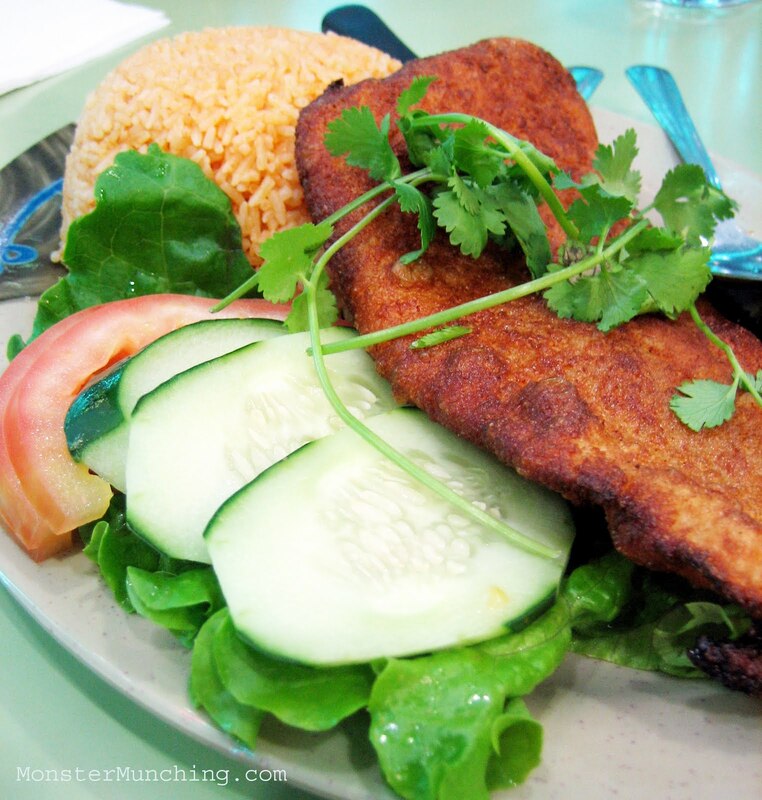 And at Little Saigon, you can eat like a king for a pauper's price, even without penny pinching tips like this. 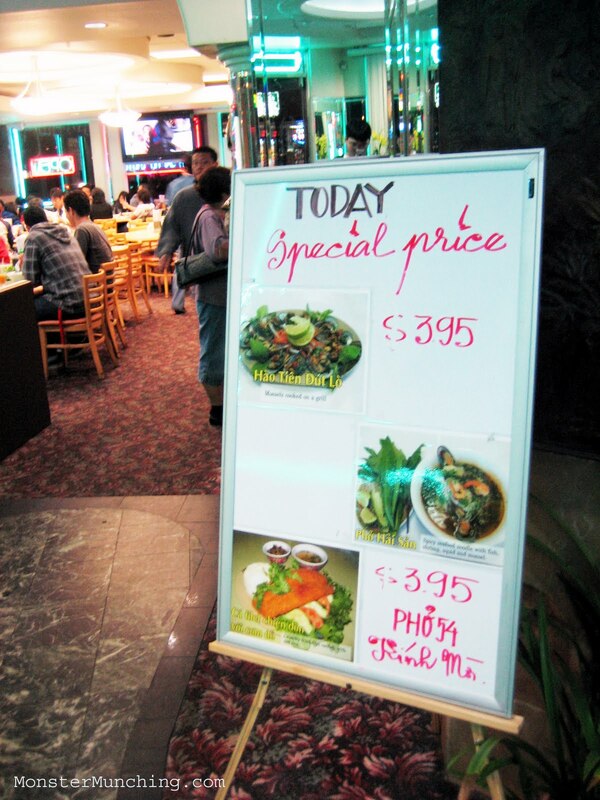 But here's the scoop I got from my Rich Dad friend: Pho 54 (or as I like to call it, to the chagrin of my lovely dining companion, "foe-fay-dee-foe"), has daily specials that slashes prices on entrees like what you see above to insane levels. I've yet seen it rise above $3.95 (note: since they scribble the prices in non-permanent marker, your mileage may vary). The dishes rotate daily (just check the whiteboard as you enter), but on a recent Sunday the deal was for three dishes: The seafood pho, the fried catfish filet, and a plate of baked mussels. For the seafood pho, the normal plate of accoutrements (bean sprouts, saw leaf, basil, lime, and jalapenos) are presented first. But I didn't need any of it except the bean sprouts. The broth, in actuality, is tom yum, the sweet/sour/hot elixir that Thai restaurants serve in those chimney pots, and it needs no further embellishment. Sipping the punchy brew made my brow dampen and mouth throb instantly. Here, Pho 54 one-ups the Thai staple not only in price, but with noodles and so much seafood it renders the toll I paid almost criminal. Chunks of fish, two mussels, squid scored like a pineapple, and a fistful of shrimp were all boiled to its wiggly best. Every morsel was tender; nothing was overcooked, which proves my theory that everyone in Little Saigon knows how to treat seafood. Then there was the fried catfish filet -- an enormous slab of the river swimmer, here boneless, lightly-breaded and deep fried to a golden brown. A gossamer-thin crunch hid the virgin white of its flesh, which was moist, supple and without any of the muddiness I usually associate with the bottom-dweller. For dabbing and dunking (or all around slathering), there was a spicy pink concoction that matched the color of the dome of rice; but the sauce tasted like Sriracha-laced Thousand Island. Conceivably, I could eat at Pho 54 every day, save a bundle, and some day, be as rich as my friend. If his secret is being cheap, I'm already halfway there. You had me at the first pic. Have driven by there many times, next time ,I will be stopping! 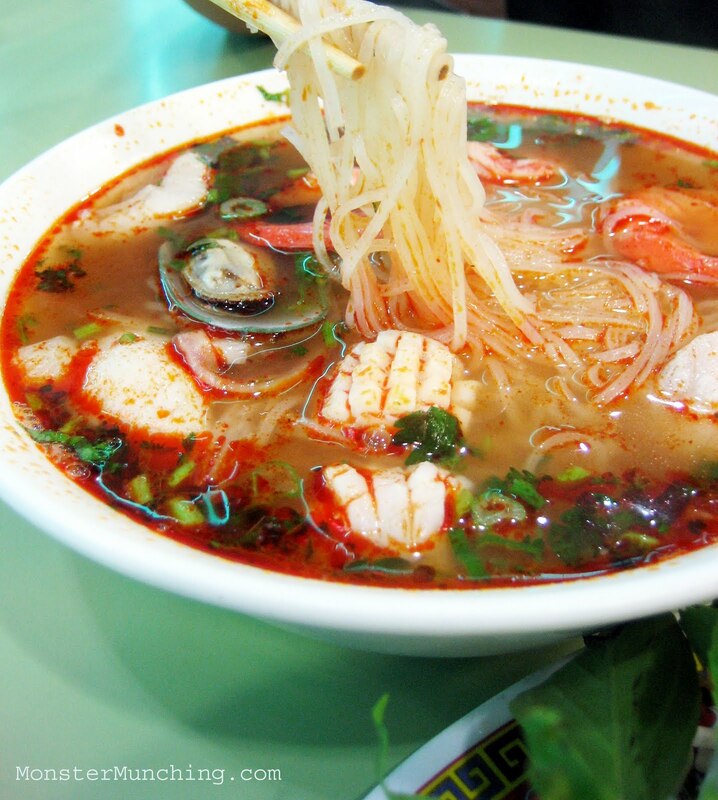 That seafood pho looks fab! This place has got to be a dump but heck I still come back for the food. Easy parking, plenty of room inside, I have eaten here before as it turns out several years ago. Nice lady took my order (no in you face pressure to pick something). Ordered the Pho Hai San, the fish soup, which was on special, large size. Mine wasn't as photogenic as Elmo's was ( better food stylist, mebbe? =), but the flavors & textures were spot on. And with a (free) drink, out the door for $5.38 lunch - are you kidding me?? I love these older VN places that have been in families forever, there is pride there in the food they serve. Her smile as I paid & thanked her spoke volumes. Ha! Tom Yum soup at a Vietnamese place. And I had a pho style beef broth at Thai Ritz in Irvine (had to be close to UCI :) ). How funny. I don't think it's ironic as people who I know that have plenty of money usually recommend lots of places that give great values to me :). And if they do give something expensive it is usually something that is very worth the $! HAHA on Charlie Palmer. I found it weird how the items at Costa Mesa (e.g. desserts, 10 dollars instead of 9) cost more than at Aureole. Makes no sense when Aureole is definitely the nicer restaurant! You're fast! Glad you were able to partake and enjoy. And they do a large one? Sweet. In truth, we were barely able to finish the two dishes we ordered. Too. Much. Food! Also, Pho 54 seems to be a place everyone's been. My lovely companion said the same thing as we pulled up: "Oh! I've been here before!" It's been a while since I returned to this restaurant. Last time was 5 years ago. It's actually been remodeled. Quite swanky now, actually. The blue neon is still as cheesy as ever though. The melding of food cultures continues! That is odd that SCP would be more expensive than Vegas. But then Vegas has fiercer competition, I suppose. Love me banh xeo. Does Van's do a really crispy one? Thanks for the comment and the compliment. I wish I could do one a day, but then it would kill me. re: Van's for bahn xeo. Most def the bestest place for this dish! this is our go to place for late night eating...love the free drinks!!! I agree, 1 post per day would be too much on yourself! Just photos usually takes me about about 20 minutes or so depending on the amount of photos I have. LV does have quite fierce competition; even among Mandalay Bay itself there's already plenty of choices to choose from! Well alright! I guess I know where I'm going for banh xeo! That's one thing I couldn't figure out. We didn't get the free drinks, but I figure it had to do with the fact that we got their specials, which already presented a loss of profit on their part. So true. Food blogging would be a thankless job if we didn't have readers who give us feedback! It looks like all of the Pho 54s have the same daily specials. I ate at this one on Brookhurst and also the Pho 54 on Westminster Blvd. There is also a Pho 54 on Magnolia and Bolsa that probably offers the same specials. Pho 54 offers a free drink with any of their regular entree items but not with the daily special. We asked about that the last time I was there. It looks like the good times are over. It's a few months later, and Pho 54's specials are no mo'!